Desserts, particularly chocolate ones, are often advertised to women as indulgences they can use to overcome romantic disappointments, or even as substitute sources of love. Here's yet another example. Indeed, you can calculate how much dessert you're going to need by how much time you invested in the guy ("Count the years you dated. If it exceeds 5, double the recipe."). 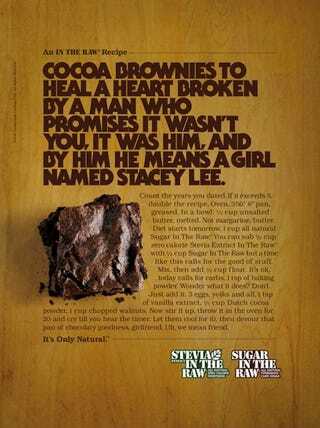 The ad is also a great example of the contradictory messages women get to be thin but also indulge - today you can "devour that pan of chocolaty goodness," full of butter and sugar, while you cry over your lost love, but it's a short-lived reprieve. Inevitably, you now being single and all, the "diet starts tomorrow."